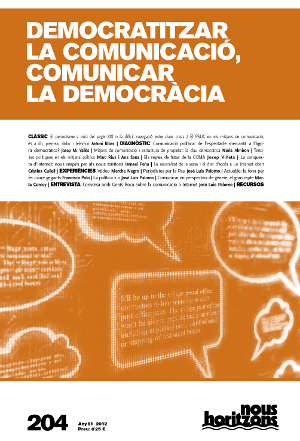 Nous Horitzons — the review of the Fundació Nous Horitzons — has released issue #204 with the quite explicit title of Democratizing communication, communicating democracy (original title: Democratitzar la comunicació, comunicar la democràcia). I was asked to write a piece where to reflect about what can be done and what cannot be done on the Internet , in the sense of what is allowed, what is not, where are the boundaries of our civic rights, where do different rights collide (e.g. freedom of expression vs. intellectual property rights), etc. My article, The conquest of Internet: new maps for new territories , is originally written in Catalan ( La conquesta d’Internet: nous mapes per als nous territoris — Spanish translation also available) and takes its title from William Gibson’s documentary No Maps for These Territories! . I ended writing what it looks like a slightly different thing: that there is not an actual collision of rights, but the dawn of a totally new model of society. And what looks like a collision of rights is, indeed, the fight to set up new institutions, appoint new leaders and shape up this new model according to each one’s own views. Thus, the apparent collision of rights is but the symptom of a higher level matter: what is the “global order” going to look like in the next decades after the actual order, based on the industrial paradigm, has become obsolete by Information and Communication Technologies. I want to heartily thank Marc Rius for the invitation to write this piece, for his patience on my repeated delays and, most especially, for not changing a single comma on what I acknowledge is a dense text that goes way beyond the simple answer to what can and cannot be done on the Internet. Peña-López, I. (2012) “The conquest of Internet: new maps for new territories” In ICTlogy, #103, April 2012. Barcelona: ICTlogy. The magazine is in Catalan and its target is Catalan people, so I very much doubt there will be any ‘official’ translation to English (the Spanish translation is mine and I did it to reach out Spanish speakers). Thanks for the interest, BTW!